Have you ever wanted to do a crowded scene in DAZ Studio, but run into problems with limited memory? Well, there’s an easy way around that: instancing. There are some pretty severe limitations to this method, but it’s really light and easy on the memory. There you have it, a rather annoyed-looking Gianni dressed as a barbarian in a desert wasteland. Now for the next step, and an illustration of a hidden catch of instancing. I’m going to select Gianni, then go up to the “Create” menu and select “New Node Instances”. It asks how many, I leave it at the default value of ten. Then voila, I have my fantasy raiding party! Or do I…? Oops! There’s something missing. If you’re going to instance a figure, the clothing absolutely has to be parented to it, or you get a whole bunch of naked people. So now I’ll parent everything properly, create my instances, and drag each one into position. Instances can be selected individually or as a group, so you can drag the whole group into a rough approximation of where you want them, then select and move each one. 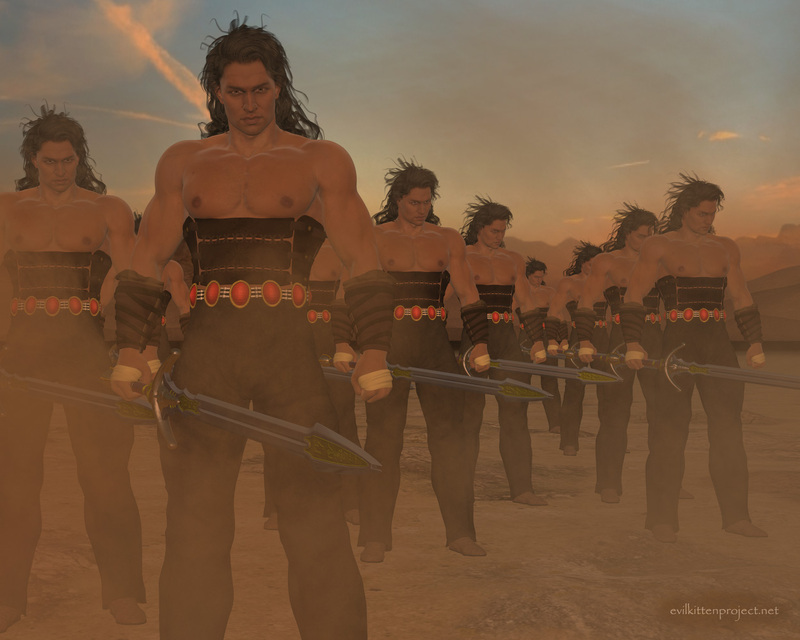 Okay, here’s my group of barbarian warriors, illustrating the one major drawback of instancing: they all look the same. The similarity of the figures isn’t the end of the world, though. There’s a way around it. 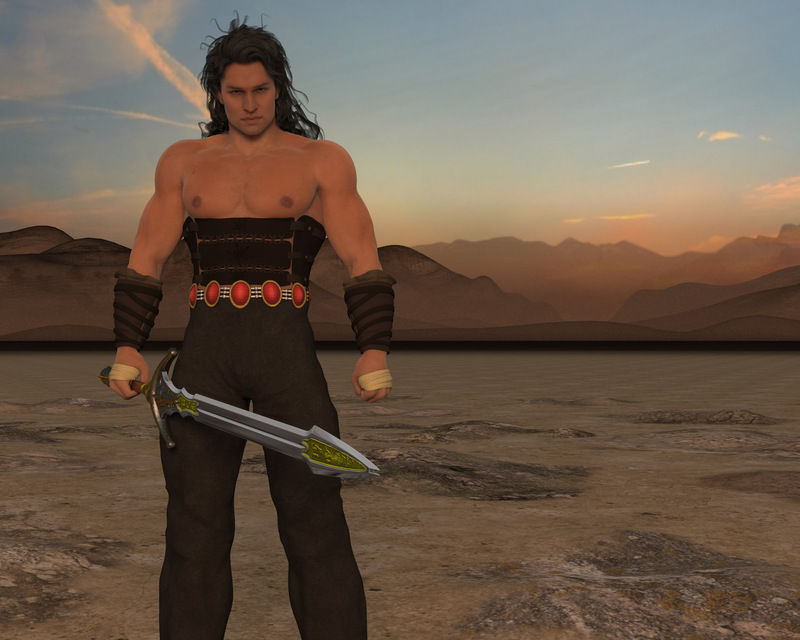 If you create, say, five different warriors, all in different poses and maybe with variations of armor, and of course different hair and weapons, then you can create instances of each warrior. Vary the number, too, so there’s maybe five black-haired guys, and eight with their swords overhead, or whatever. Then intermix all the instances and their original figures, and you’ve got an active battle scene, without completely destroying your computer. 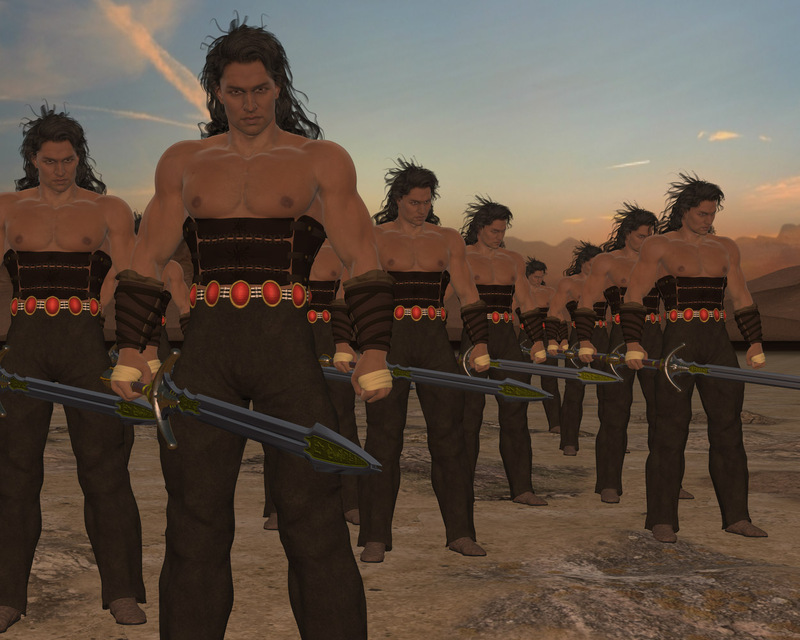 An example of instancing in DAZ Studio, postworked in Photoshop to tweak colors and add dust. This entry was posted on Monday, October 27th, 2014 at 8:49 am. You can follow any responses to this entry through the RSS 2.0 feed. You can leave a response, or trackback from your own site. Excellent tutorial. Was thinking about posting something like this myself. This has been made SO much easier in recent versions. I’ve been surprised how many people I run into that don’t know how to clone/instance.